PrepareWise was founded in 2011 with company headquarters located in Salt Lake City, Utah. The real name of the company is actually Legacy Food Storage, but they have adopted the practice of selling their products under different names. The ones we were able to dig up so far include Buy Emergency Foods and PrepareWise. We don’t know the reasoning behind this business practice, but as long as the products meet our criteria, we don’t really care about the specific nomenclature. To avoid confusion, we’ll just call them PrepareWise. The company focuses on prepping families for emergency survival. They are well aware of the strong competition in this field and strive to surpass other companies in both quality and price. Keep reading our PrepareWise review to get a detailed picture of the company and their products. First of all, PrepareWise has a low-price guarantee. They definitely put their money where their mouth is when they say you’ll get a much better price when buying Legacy Premium food than when you buy from any other site. Excellent customer service is a point of pride for PrepareWise. Their friendly and competent staff will answer any question you might have and help you reach the best decision for your specific survival needs. You can always contact the support staff by phone, email or the contact form on the website. 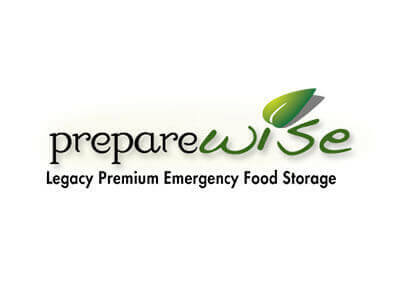 PrepareWise shares the same survival goals with their customers, combining their love for gourmet food and emergency survival. The online customer feedback explains why PrepareWise creates customers for life. Free shipping for all domestic orders makes an excellent service even better. The shipping is not only free but also very quick and convenient. Stacking your basement or bug out shelter with food supplies has never been easier. We’ll talk more about the food quality in the following sections of this PrepareWise review, but we need to mention that PrepareWise food supplies are of the highest quality, completely safe, and free of any artificial ingredients and toxins. Their manufacturing partner Honeyville Grain started their food manufacturing business back in 1951, which is a testament to high-quality ingredients and a reliable manufacturing process. Privacy and security are a concern for every smart prepper, especially when buying something online. That’s why the people behind PrepareWise go out of their way to ensure a secure online buying experience when ordering from their site. They use a secure server and implement a powerful security barrier to protect the personal information entered into their site. Their website is verified by GoDaddy, Authorize.net, and PayPal, also meeting all the requirements set by Google Checkout. The previously mentioned manufacturing facilities used by PrepareWise are certified by NSF as SQF Level 2 Food Safety rated facilities. They also hold gluten free, USDA Organic, Non-GMO, Kosher, and Halal certifications. The packaging is then submitted for testing in order to determine and verify moisture and oxygen levels. Legacy survival food supplies have a shelf life of 25 years, so you’ll never have to worry about stacking your emergency shelter again. While doing research for our PrepareWise review, we were particularly pleased to discover that all their meals are 100% GMO-free and contain no MSG, autolyzed yeast extract or artificial flavors. The food supplies come in stackable storage buckets so they shouldn’t take too much room in your shelter. PrepareWise sells emergency meals with the lowest percentage of residual oxygen, only 0.11% on average. After you place an order with PrepareWise, the shipment will leave their facilities within 2-5 business days. PrepareWise uses FedEx for all shipments. Shipping is absolutely free if you live in one of the 48 contiguous US states. If you live in Hawaii, Alaska or Puerto Rico, PrepareWise will cover the cost of domestic shipment and you’ll have to pay the rest. Most of the products are refundable within 30 days of delivery with a 5% restocking fee. In order to receive a refund, you’ll have to contact a customer service representative by phone or email. PrepareWise is definitely a survival company to keep an eye on. Their food collection is nothing short of amazing and they also offer a limited amount of survival gear. If you carefully read about the effort and security measures put into the manufacturing of Legacy food lines, you will realize that this brand will not let you down once the calamity comes knocking. To conclude our PrepareWise review, we can only recommend their emergency food supplies as a bulletproof plan for getting you and your family safely out of any sort of emergency survival scenario. It only takes a couple of minutes to prepare these and they offer enough calories to get you gong when shtf. Free shipping and preeeety low prices! Are you kidding me right now?! Most of the meals were delicious but a small number felt kinda bland so I had to add stuff on my own.